Recipe submitted by Adrienne Sapp, Corporate Marketing Manager, Wal-Mart. 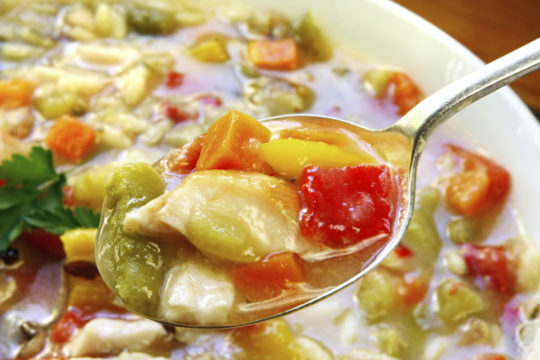 There’s nothing like chicken soup to warm you up on a cold winter’s day. This perfect comfort food is just like how Grandma used to make it. The addition of spices and vegetables gives this soup a great and customizable recipe for you to try out! Small bunch of herbs, tied together (may include thyme, parsley, bay leaf and savory teas). Add all the remaining ingredients except the onion, green beans and red bell pepper, and bring to a simmer. Simmer uncovered for about 3 hours. Skim any fat or grease that may develop on top. Remove the chicken; clean the meat from the bones. Dice the meat and reserve. Discard the bones. Discard the bunch of herbs. Refrigerate the stock and remove the fat from the top after it cools. In a stockpot, combine cooled chicken stock, reserved chicken and reserved vegetables. Add 1 large onion, finely chopped, green beans and red bell pepper. This recipe makes 6 to 8 (1 1/2 cup) servings.